A brain-scanning helmet developed to monitor mental energy and focus is at the centre of a ground-breaking study exploring the mind as the next frontier of performance. A month ago, we brought you a story of the experiment being undertaken by Ford Performance in conjunction with King's College London and tech partner UNIT9. Its purpose was to explore how mental training techniques used by racing drivers and professional athletes – breathing meditation and visualisation – affect the brain's performance. But, more than this, it wanted to see if ordinary people might be able to adopt these same techniques to their own advantage in everyday life. The experiment measured the brain waves of professional race drivers and a control group of "normal" drivers. 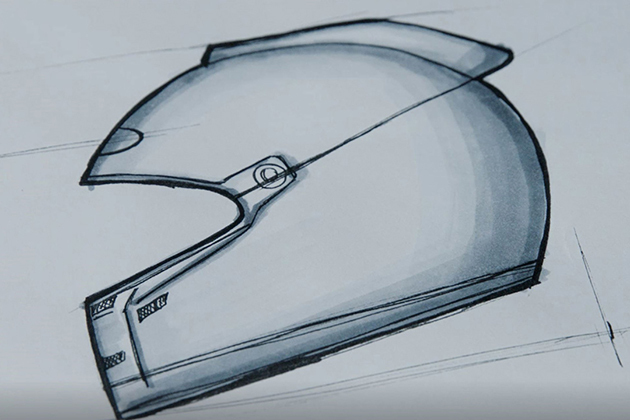 Tech engineers and product designers collaborated to modify a standard FIA approved helmet to contain an EEG (electroencephalography) headset – a device that can read electrical activity from the brain. They then recorded driver focus to get a measure of the mental effort drivers dedicated to driving. Ford's 'Psychology of Performance' study saw racing drivers, including World Touring Car winner Andy Priaulx and World Rally Champion Sébastien Ogier, donning the smart helmet. Dr Elias Mouchlianitis of the Institute of Psychiatry, Psychology & Neuroscience, King's College London and Yates Buckley, technical director at UNIT9, led the team collating data, monitoring the drivers' brainwaves and measuring their concentration and reaction times as they took on a series of virtual driving challenges. 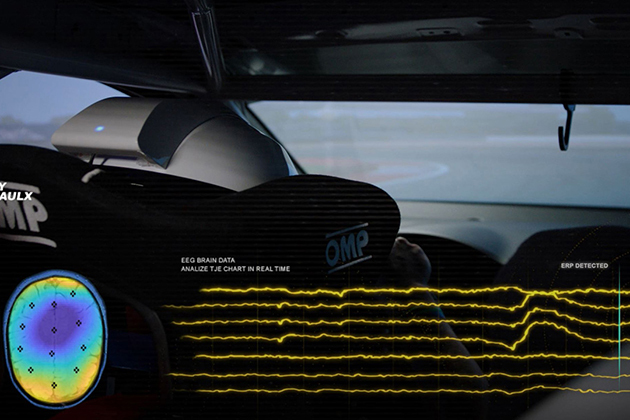 "Using EEG, we could make a mental map of the track, and measure the mental energy that the driver is dedicating to the task," explains Buckley. "Through this innovative approach, we have the ability to work with a whole new set of metrics." Mental training techniques have long been used in sports psychology to help professional athletes stay at the top of their game. However, the study also included members of the public to see whether their performances might also improve if they adopted the same breathing and visualisation techniques as the racing drivers. "The experiment is actually quite exceptional as we're using expert drivers, which is a population that researchers don't often have access to, and using a control group of normal drivers," explains Dr Rita de Oliveira, a sport psychologist. "Mental training can reinforce the neural connections that are used in driving performance, so this has interesting applications for everyday life. It's an area that is new and we don't know much about yet." What quickly became clear in the results was that racing drivers are always 'on', which is to say 'in the zone'. Having trained their minds to such an extent, behind the wheel they are extraordinarily focused – they were up to 40 percent better than the average person when it came to ignoring distractions. This isn't particularly surprising, given the levels of training and discipline required to compete at the very top, as Priaulx and Ogier have experienced first-hand. But, what was extraordinary about the results were the effects mental exercises had on the other participants. Both of those groups who practised the breathing meditation and visualisation techniques improved considerably – by as much as 50 percent – and had mental reactions much more like the professional drivers. The future for Ford's smart helmet could see the prototype developed into an EEG-equipped racing helmet. In theory, professional drivers could have their brain activity transmitted back to the team during a race, alongside other in-car telemetry. The ramifications open up a new frontier in sport, where mental conditioning is analysed scientifically, as much as a physio monitors the conditioning of the body. And the implications of the research for ordinary people are equally exciting. As Priaulx puts it: "Our experiment showed that simple mental training ahead of a task can help anyone to improve focus and ignore distractions, making them more successful." In a world where we are constantly being bombarded with information and where our technologies have the capacity to endlessly distract us, being able to routinely concentrate on the task in hand and perform to a high level are important attributes. Whether it's a big presentation, a job interview or simply trying to cope with the hectic pace of our interconnected world, these mental techniques can be beneficial to all of us. The Ford study, it would seem, is just the beginning of our exploration into this fascinating new frontier. Read more information regarding Ford and its products and services.